Happy Cookie Day! Today starts the beginning of my cookie showdown. I'll be featuring all different types of cookie/dessert recipes from now until Christmas so I can help with all of your baking needs. Whether you're looking for a cookie exchange idea, edible gifts for your colleagues, or you just want to switch up your Christmas dessert menu, I've got a bunch desserts lined up just for you. And I'm kicking it off with a double whammy. 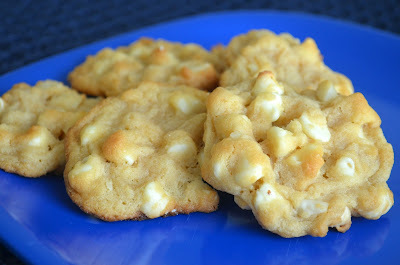 I'm not a fan of white chocolate in general, but white chocolate chip macadamia nut cookies have always been at the top of my favorite cookie list. Don't ask. 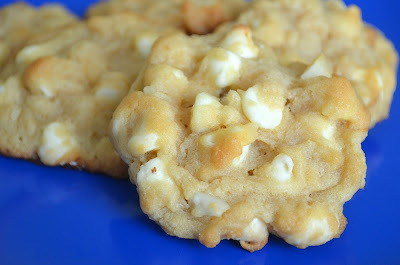 The soft texture of the cookie/bar and the crunch of the macadamia nut is the best, especially since macadamia nuts sort of melt when you bite into them. Don't ask about that either. Just give either one of these a try because they are incredible. Enjoy! Preheat oven to 350° F. Grease 8-inch square baking pan. Combine flour, baking powder and salt in medium bowl. Beat sugar, butter and vanilla extract in large mixer bowl until creamy. Beat in egg. Gradually beat in flour mixture. Stir in morsels, nuts and coconut. Press into prepared baking pan. Bake for 25 to 30 minutes or until golden brown and a toothpick comes out clean. Cool completely in pan on wire rack. Cut into bars. Combine flour, baking powder, baking soda and salt in small bowl. Beat butter, brown sugar, granulated sugar and vanilla extract in large mixer bowl until creamy. Beat in egg. Gradually beat in flour mixture. Stir in morsels, coconut and nuts. Drop by rounded tablespoon onto ungreased baking sheets. Bake for 8 to 11 minutes or until edges are lightly browned. Cool on baking sheets for 2 minutes; remove to wire racks to cool completely. Happy New Year and a Recipe Round-Up!